Slanted walls give you a true sense of life inside a pyramid while adjoining suites allow plenty of room. The Pyramid Suite features a soaking tub, separate sitting room, and two queen beds that await your arrival. 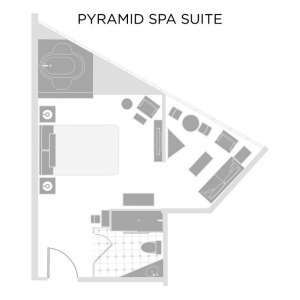 The floor plan for the Pyramid Queen Suite. Newly remodeled with modern luxuries, this suite boasts a comfortable living room featuring a flat screen TV, as well as a separate dining area complete with a refrigerator, gourmet coffee maker and full wet bar.